‘Tis the weekend after Thanksgiving and everyone is already in mega Christmas mode. Did it start even earlier this year?! How can you resist jumping on that jingle bells bandwagon? 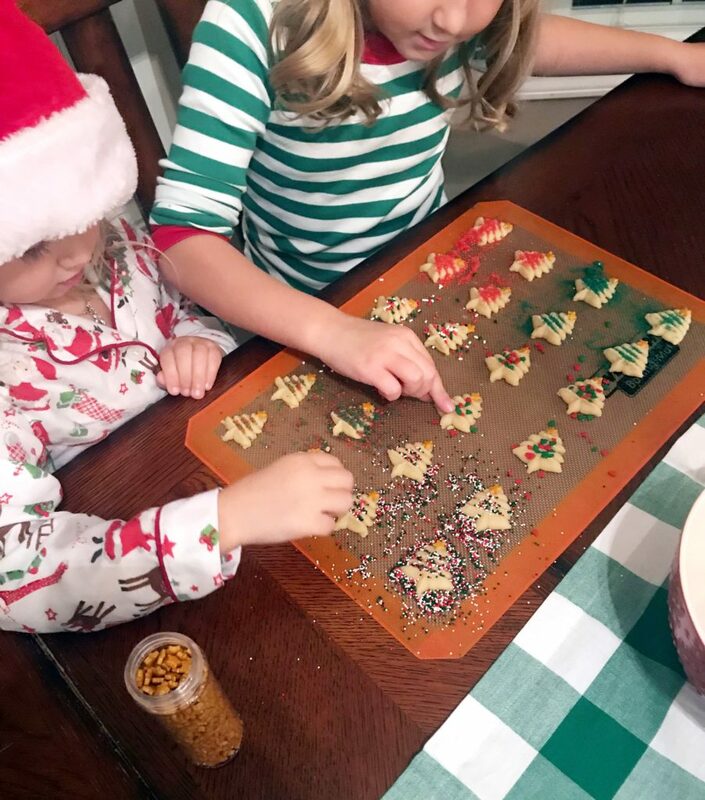 It is all about making memories and traditions. 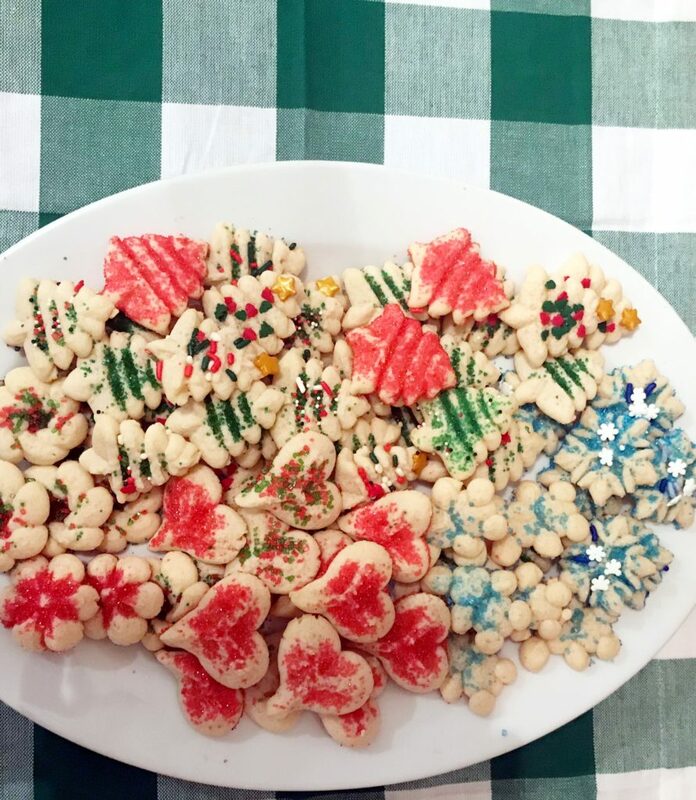 If you are looking for a new tradition this holiday season…classic Spritz cookies are the answer! I have such special memories of making these with my mother when I was a child. Mom would be mixing up the dough and we would play “Christmas Cookies and Holiday Hearts” on our record player. Those were the best days! Now, my own kids are getting to experience this tradition. 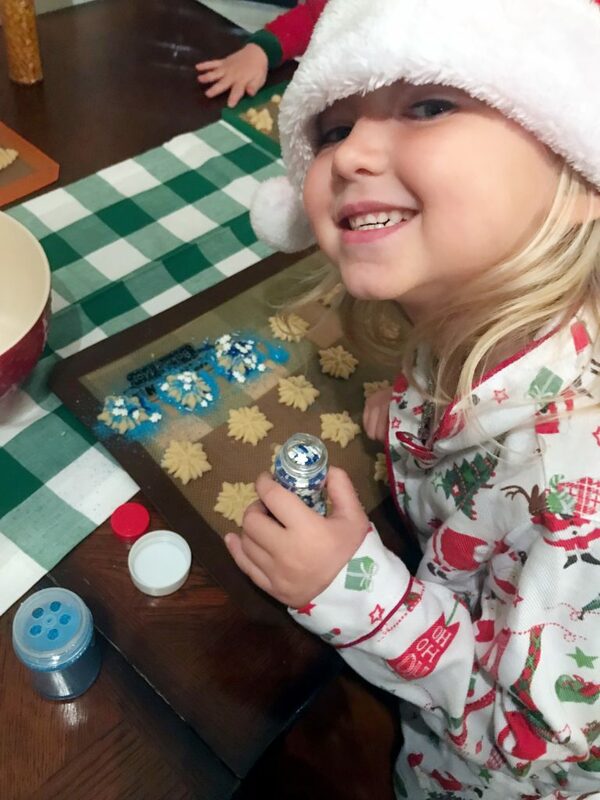 They were so excited to help with these and it is the perfect project for them. There are many reasons why these cookies are the best. The first being the almond extract. Anything with almond flavor is a win for me! You will love the flavor of these cookies. They are a German tradition and the flavor is light and buttery. They pair well with coffee and are small- so go ahead and have 5 or 6 for breakfast! These cookies are perfect for people with little patience…for example, children and myself! Don’t get me wrong, I make some wonderful recipes in the kitchen, but I also make a big mess. Cookie cutter cookies have simply not worked for me because of the precision that is needed to make them look beautiful. 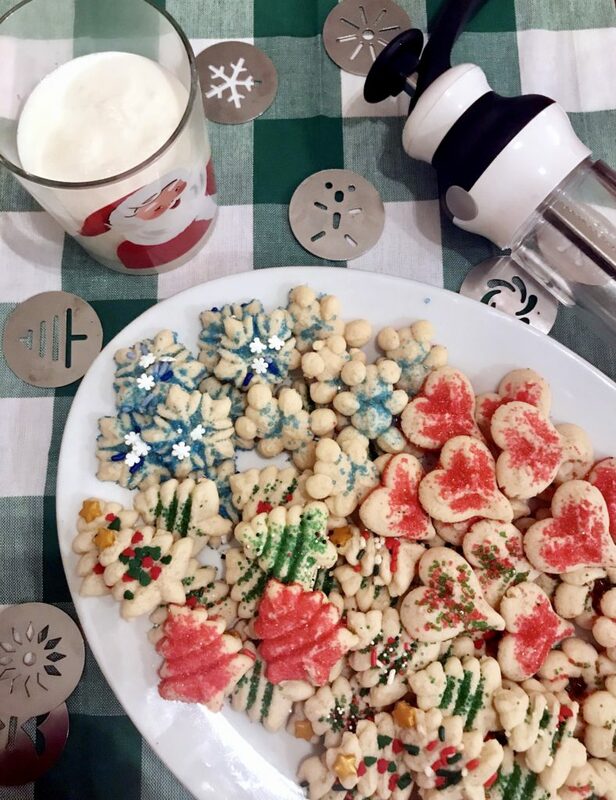 These spritz cookies are the solution! Quick, easy, imperfect and they bake in 6 minutes! Your impatient little kiddies will love it! This press comes with multiple stainless steel discs to change out and create different shapes. There are also other holidays included. My set has a clover and a seashell as well! I often make the teddy bear shape for baby showers or birthdays. 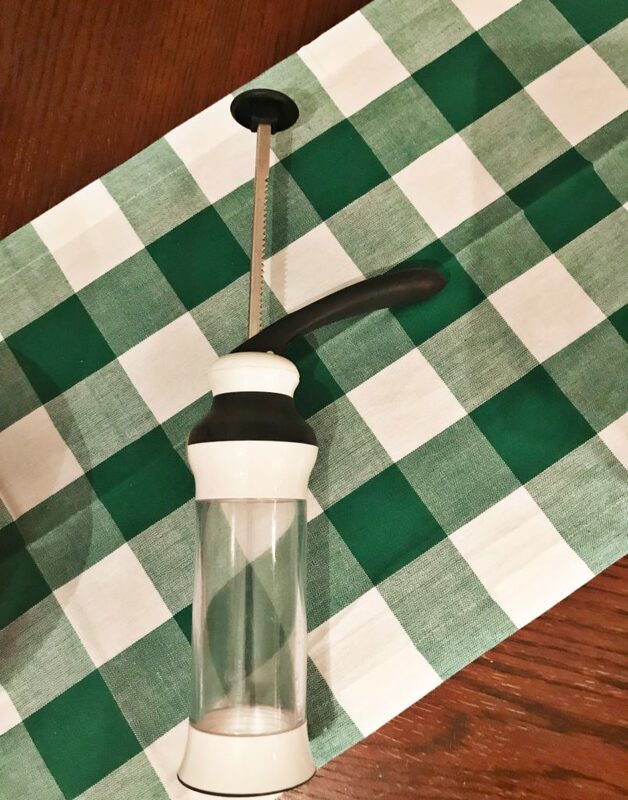 The cookie press is very easy to use. 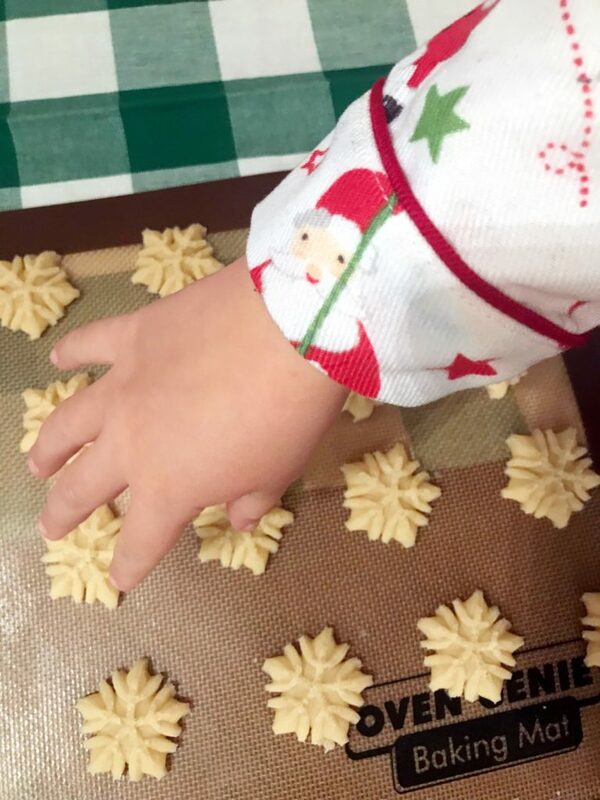 Older children can help with pressing the cookies onto the baking sheet. 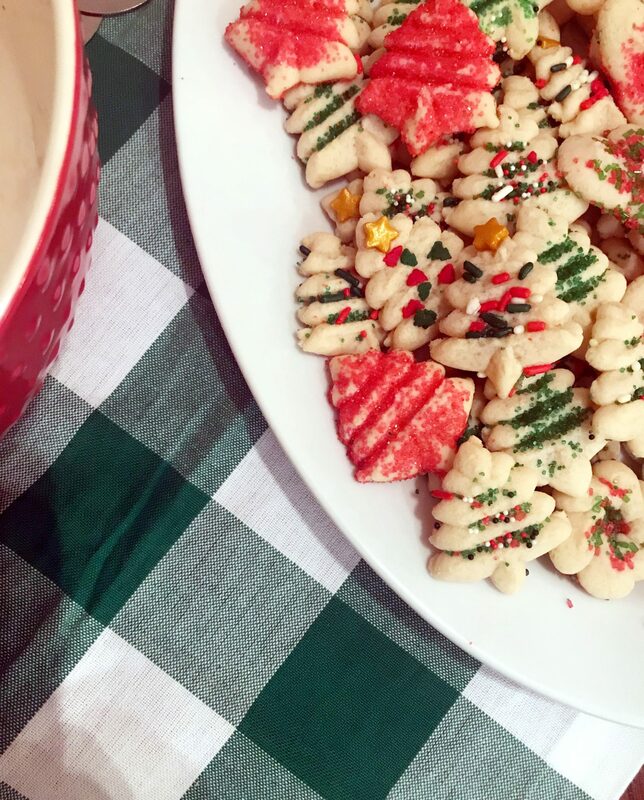 The part of these cookies that the kids will love most are the sprinkles. Grab a couple extra bottles at the grocery store because they will go quickly when little hands are using them. This year we found the golden stars for the top of our trees. These did melt in the oven, so we had to attach them right after baking. A touch of corn syrup can help them stick. 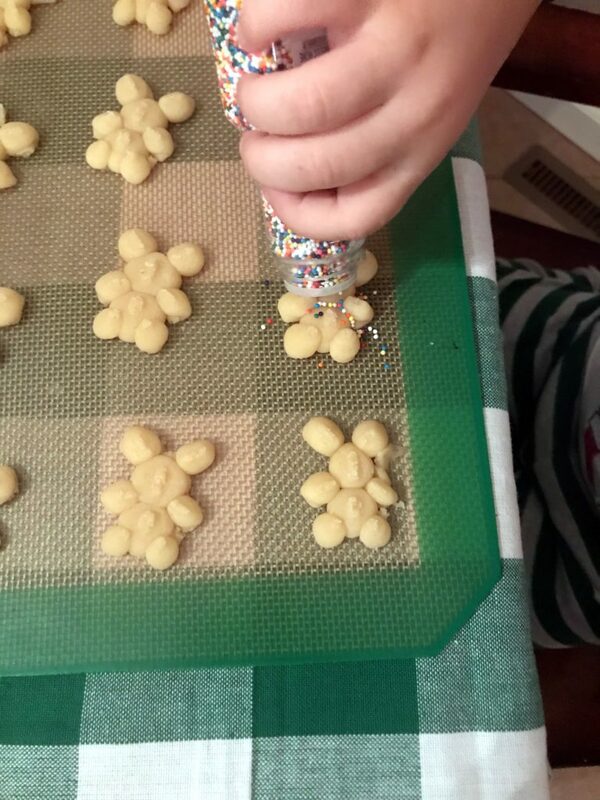 Otherwise all sprinkles go on prior to baking. 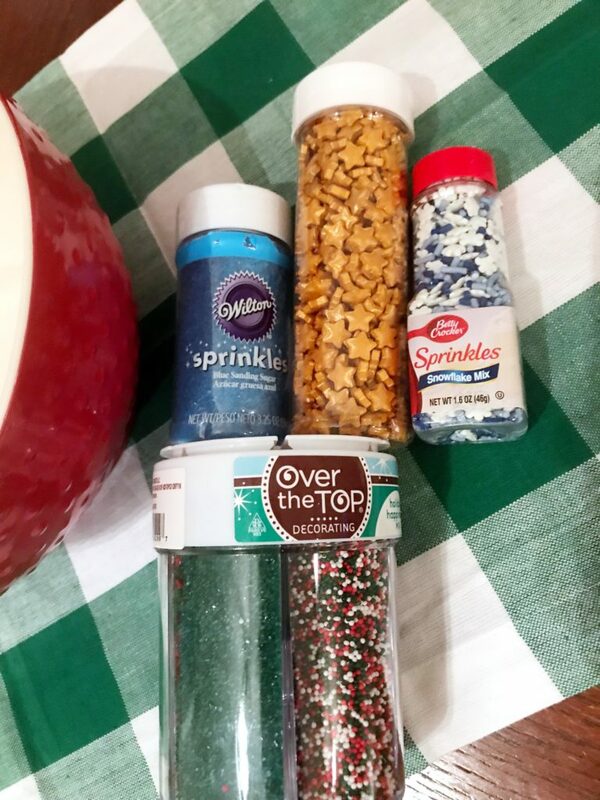 It is a good idea to have a bowl set aside to brush extra sprinkles into so they are not all wasted. 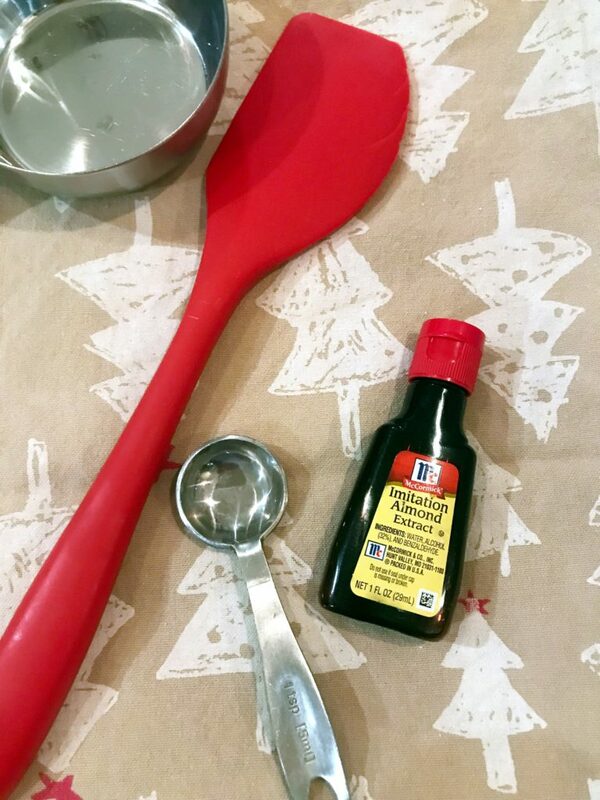 Then you can add these to cookies that are bare or you can save them to sprinkle on waffles or pancakes the next morning! We have always used these silicone baking mats for all types of cookies. The cookies slide right off when cooked! You can be working on the next batch and then transfer to the baking sheet when ready. We have several different brands and we find that they all work the same. 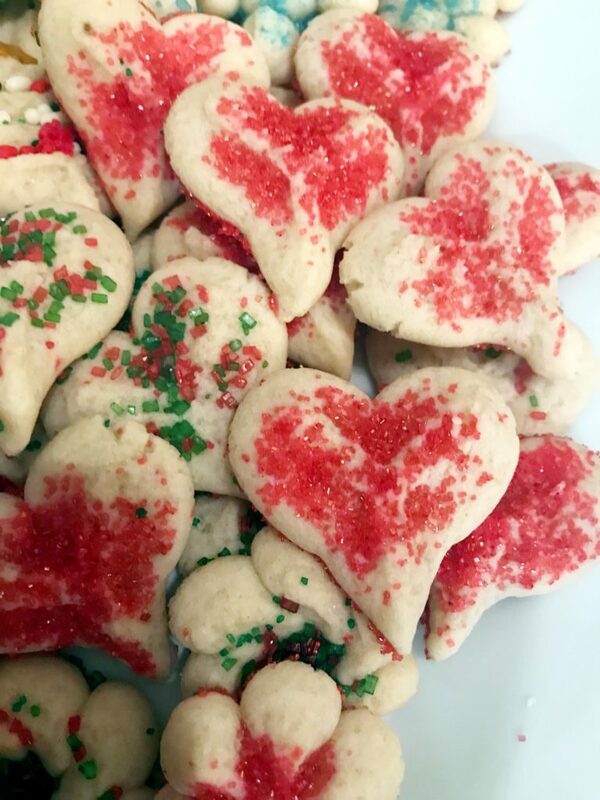 Christmas cookies and holiday HEARTS! We love this tradition! Here is the recipe adapted from Betty Crocker. Heat oven to 400 degrees. 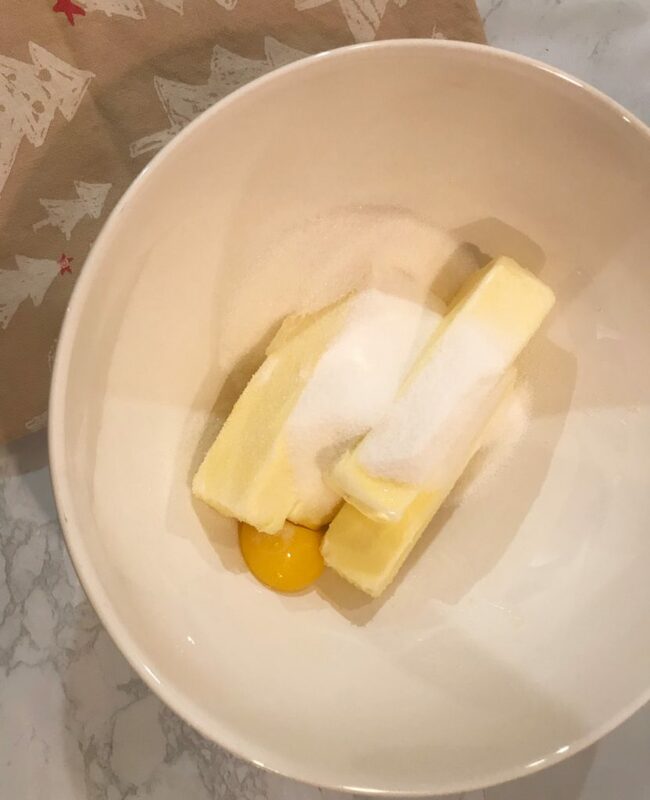 Beat butter and sugar in large bowl with electric mixer on medium speed. Stir in flour, salt, and almond extract. 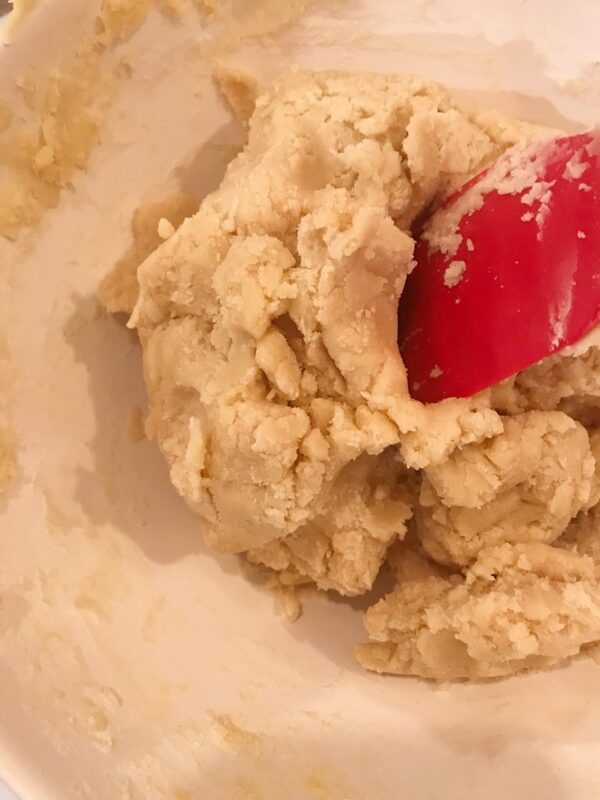 Place dough into cookie press. Form desired shapes onto ungreased cookie sheet. Bake 5-8 minuets or until set but not brown.